As the sun began to set, Mary Kate, tired from the day, wanted to sit for a moment and catch her breath. Tyler motioned towards the only place for her to sit, a swing hanging from a nearby tree. Wearily, she began her short trek in order to gain some sort of relief. As she collapsed in the comfort of the swing, her husband asked if he would like her to push him. Giggling, she said yes. He grabbed both sides of the chain, pulled her against him, and began to backup. Giggling, she screamed, "higher, higher"
Walking slowly around them, I pulled out my camera to capture this intimate and carefree moment between them. 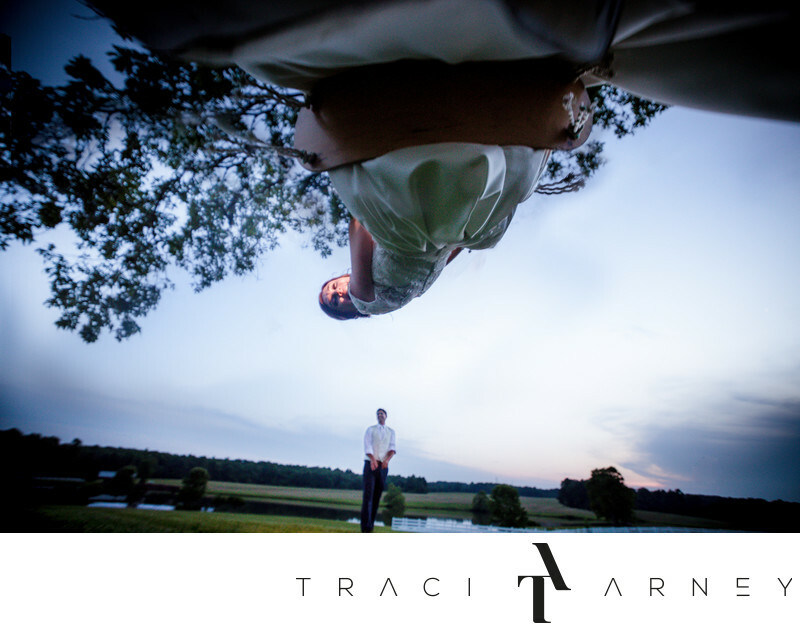 As I lowered my head to check my settings, I noticed the amount of space between the bride and the ground. A stroke of inspiration hit me. I walked up to the bride and groom and explained my vision. Then I turned around and walked a couple of feet and laid down on my back. The groom grabbed his wife and slowly backed up. I waved my hand and he let go. The bride flew towards me, faster and faster. Then she was above me. My shutter was clicking rapidly the whole time. Tyler caught Mary Kate and she hopped off the swing. Walking towards me, they asked if it worked out. As I showed them the back of my camera, and saw their faces light up, I knew that my vision was so unique and unheard of. Location: Adaumont Farms 4941 Finch Farm Rd, Trinity, NC 27370, USA. Keywords: Adaumont Farm (27), Bride (171), Farm Wedding (12), Groom (72), NC (636), Outdoor Wedding (30), Swing (3), Trinity Wedding Photographer (3). 1/200; f/2.8; ISO 1000; 14.0 mm.